This desk clock does much more than tell the time for you. It is also a motion activated spy cam that is beautifully disguised so that even the most attentive person would not have any idea they were being recorded. It is fully rechargeable so there are no cords to plug in to keep it going. Also, the design is a modern yet timeless silver composition that would complement any decor. The camera inside is a high definition video camera that captures not only 1280×960 AVI video but also sound. As long as it is placed in an area that is well lit, once the motion sensor is activated, it will start recording. You also have the option of recording video manually and no one will ever know that the clock also doubles as a spy camera. It comes with a 4GB Micro SD memory card that can save up to 55 minutes of video recording. You can also place a 8GB memory card for more video space. The videos that are recorded can easily be downloaded to any PC or MAC by using a USB cable. It can be charged via the UBS cable that is included with the clock camera. 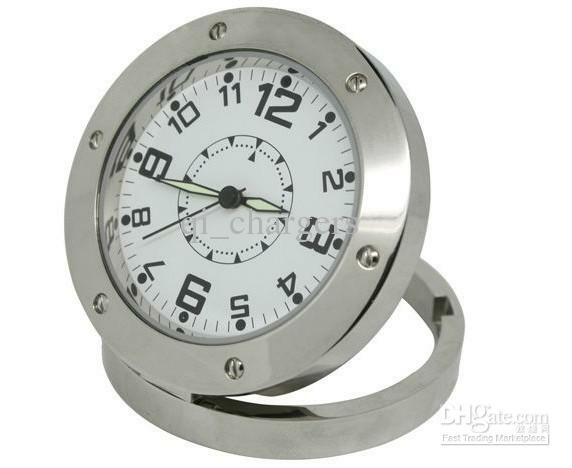 The Motion Activated Spy Cam Desk Clock is perfect for an office if you like to create video memos but it can be used in other ways as well. A popular use of the clock camera is for home security or surveillance. It can be places on a desk, a table, or even above a fireplace. Anywhere that you think you may need the option to record for security or other reasons is perfect for this item. It is ideal for a father figure or even an executive. You never know what you will find on the memory card of the Motion Activated Spy Cam Desk Clock.